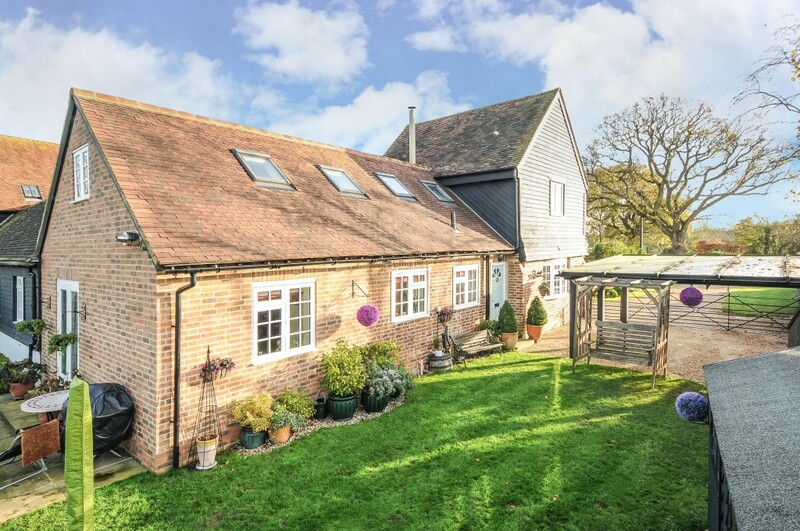 This stylish barn conversion offers generously proportioned and versatile accommodation that boasts many character features throughout; with exposed timbers and brickwork, brace and latch doors, an inglenook style fireplace and a farm house kitchen. 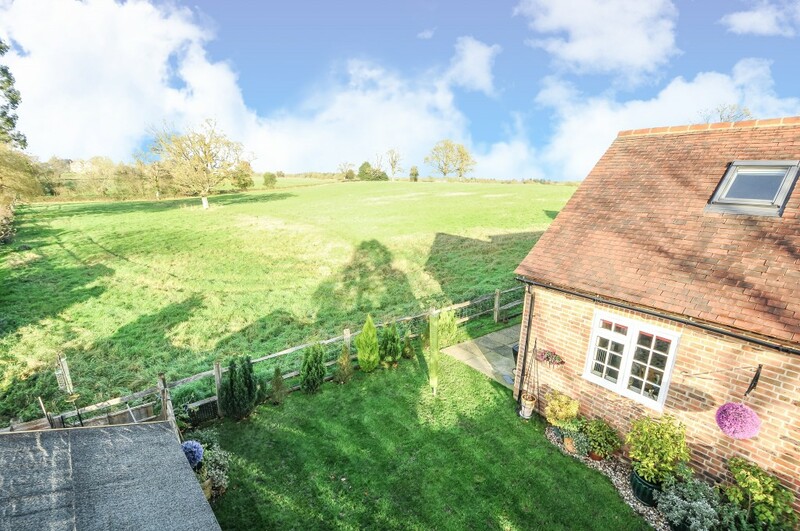 This combined with a secluded position and an open outlook over the surrounding farmland. 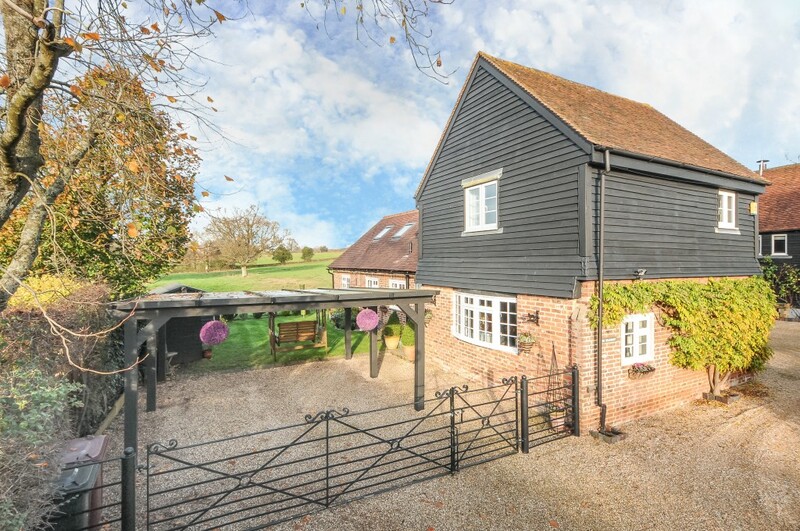 The property is approached by a gravel driveway that leads to ornate wrought iron gates and the oak framed car port. The front door is to the side of the property and leads into a central entrance hall with a tiled floor and hanging for coats. Off the hall is a useful utility room with further hanging space and room for boots, a large sink and plumbing for a washer and dryer. 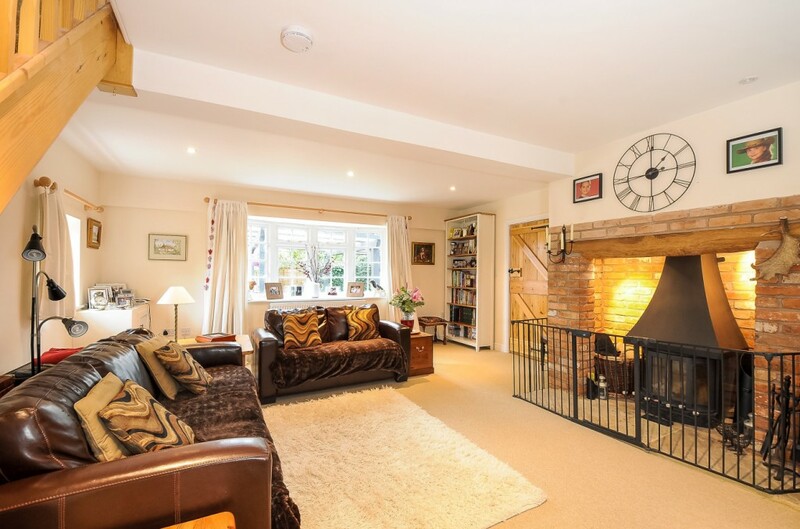 The impressive sitting room enjoys a triple aspect with a large brick inglenook fireplace and wood burning stove at the centre of the room. In the corner stairs to lead to a fabulous vaulted master bedroom which also benefits from a triple aspect. The stylish ensuite has a modern white suite of wc, basin and vanity unit, heated towel rail and a bath with shower and a glazed screen. 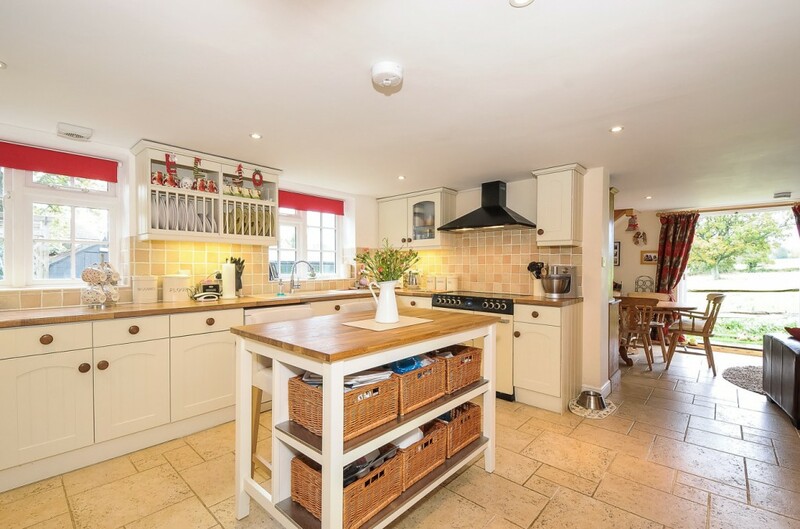 The farmhouse kitchen is warm and inviting and is conveniently situated at the centre of the house. It is fitted with a range of cream shaker style units and has a central island with a woodblock top and two stools. 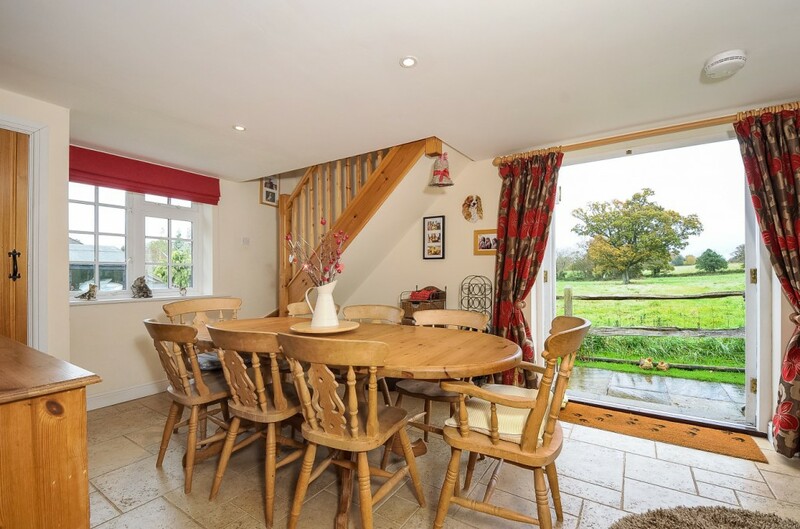 There are two big windows overlooking the garden and a tiled floor runs throughout and into the adjoining dining room, which has room for a table and chairs at one end and a sofa at the other. 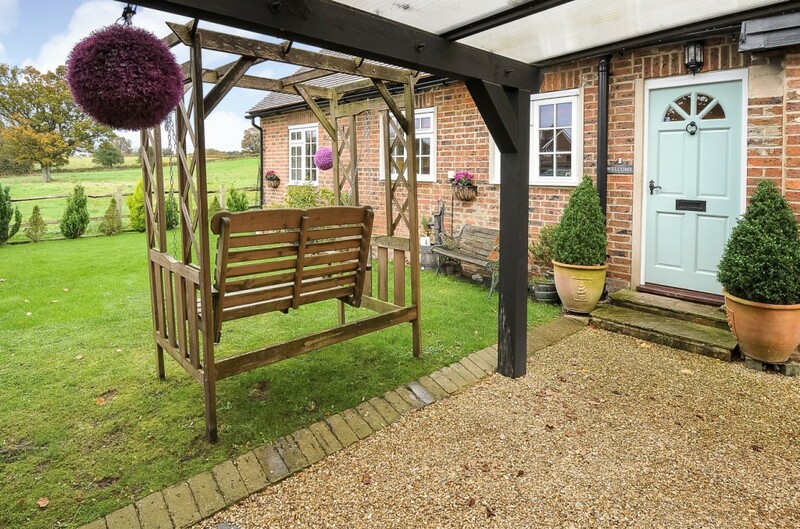 Double doors open out to the terrace and enjoy an open outlook over the adjoining farmland. 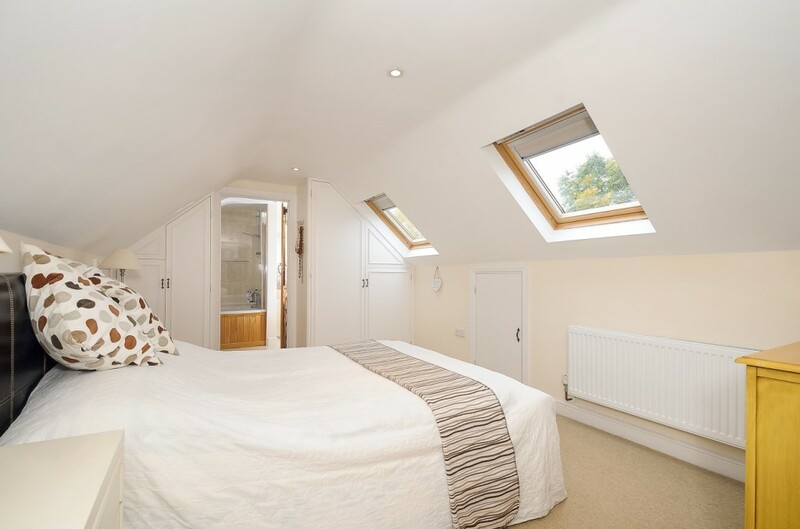 In the corner, stairs lead to another attractive bedroom with a window overlooking fields and roof lights which make the room bright and cheery. 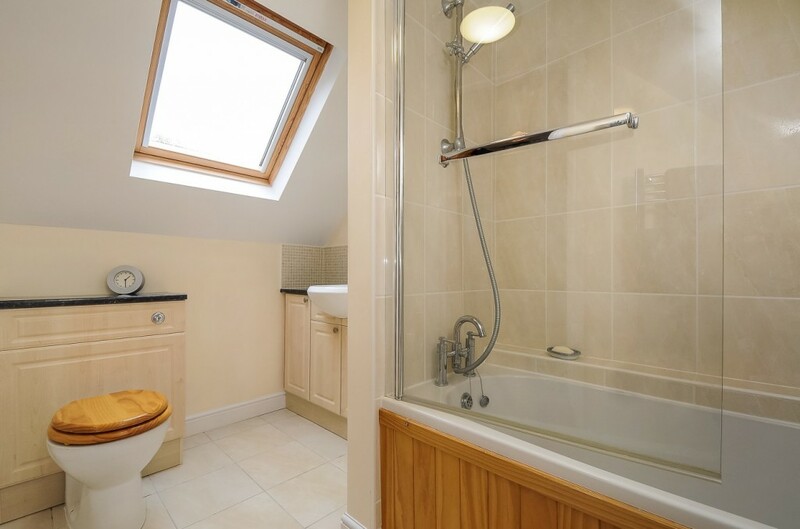 At the end is another stylish ensuite with a wc, basin, bath and shower with glazed screen, and a heated towel rail. 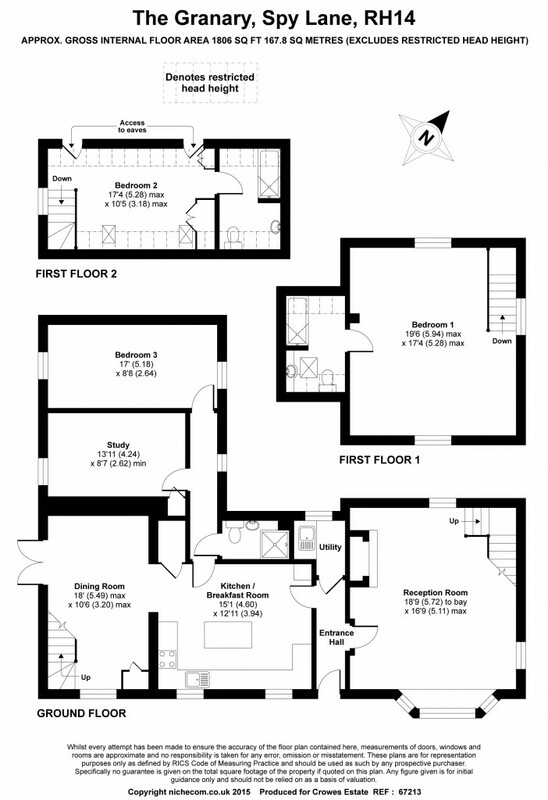 Leading off the kitchen is a rear lobby with a tiled floor leading to a shower room and two further bedrooms. 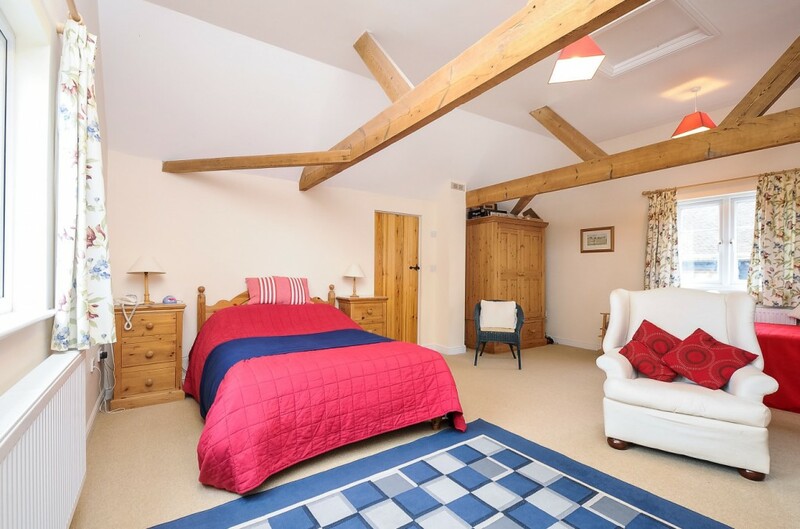 Both the bedrooms are a good size and enjoy an outlook over the adjoining farmland. The shower room is tiled and has a basin, wc and heated towel rail, as well as a power shower with a glazed door. 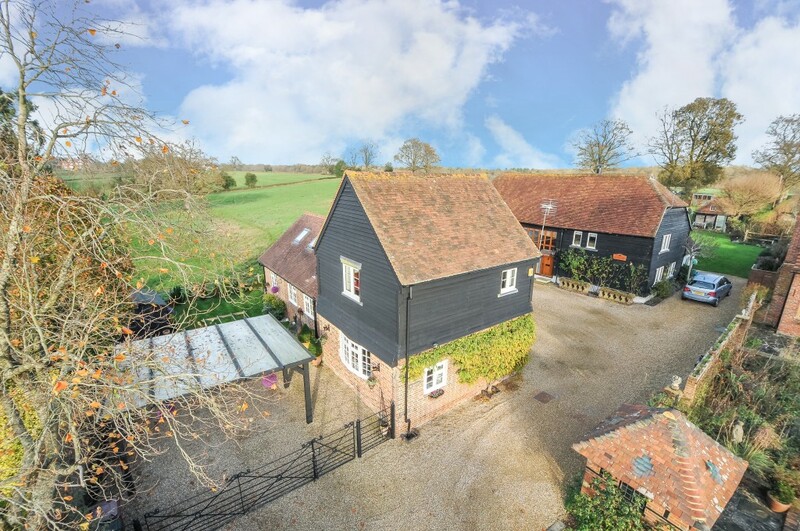 The carport provides parking for two cars and the garden to the side of the property is lawned with two timber garden sheds and a fenced area housing the oil tank and a log store. 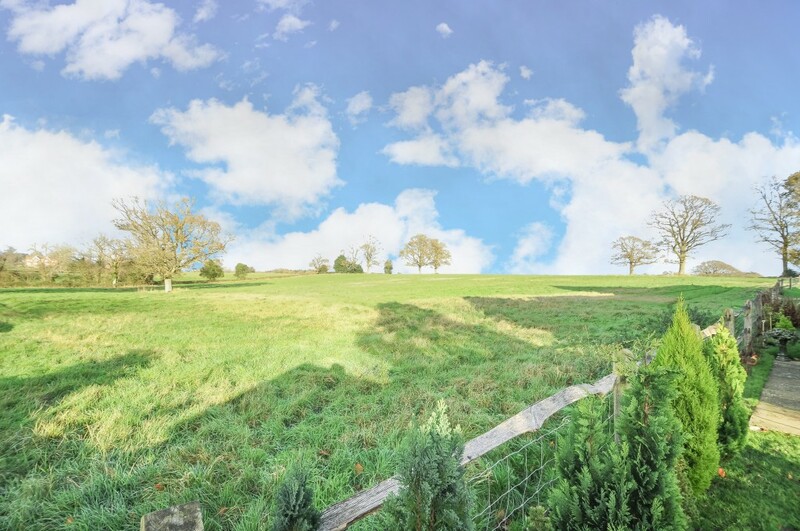 There is a paved terrace to the rear of the property and a post and rail fence runs along the rear boundary; beyond which there is an open outlook over the adjoining farmland which stretches as far as the eye can see. You can walk from the property, without the need to go near a road. This is truly the most scenic of locations, yet still close to the heart of the village. 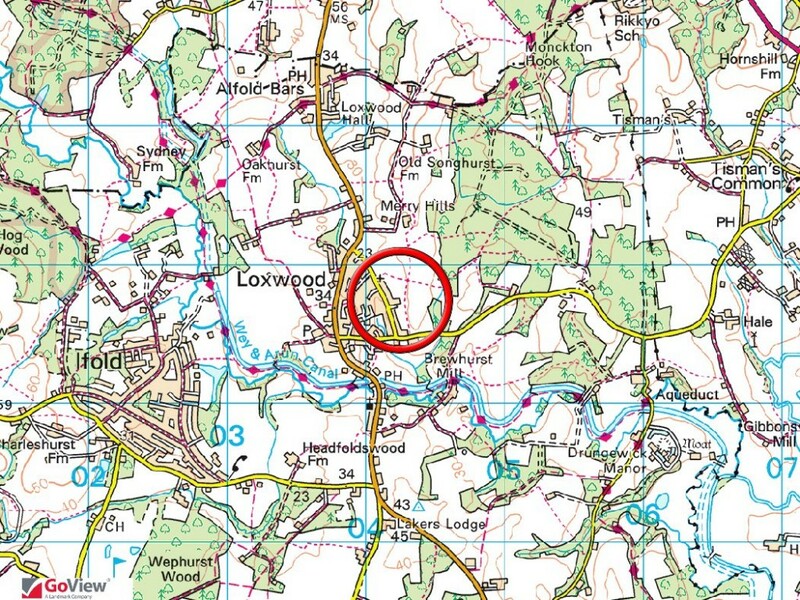 The village of Loxwood has a village store and post office, a well renowned local butcher and even a hairdresser; there is also a doctor’s surgery and a primary school. The Wey and Arun canal has a visitor centre and runs boat trips along the recently reopened navigation; there is also a choice of two excellent food pubs. 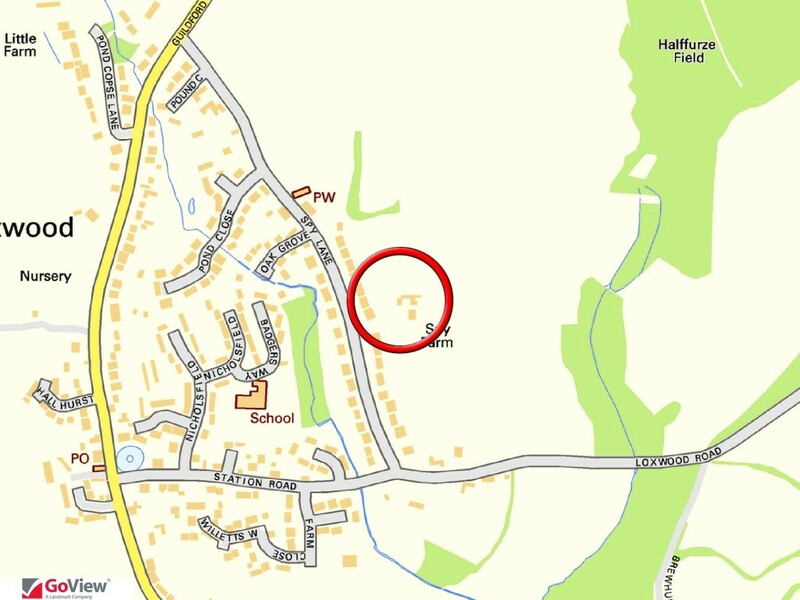 The village of Cranleigh lies 6 miles to the north and is said to be the largest village in the country. The High Street boasts an attractive range of shops, and boasts two independent department stores, M&S Food and a selection of restaurants and cafes, many with pavement seating. The modern Health Centre, Leisure Centre and Arts Centre are situated at the southern end of the High Street. There are two supermarkets and a healthy variety of independent shops and established High Street stores. The market town of Guildford is 13 miles away and provides a mainline train station with a fast service to Waterloo. The A3 also provides quick access by car to the M25 and central London. Guildford provides a diverse range of social and recreational facilities: including theatre, cinema and The Spectrum has leisure pools, an ice rink and ten pin bowling.